Wearing tons of blush pink and feeling slightly girly on a late afternoon stroll through Capitola. Sometimes it is nice to just throw something on that's simple and comfy but also looks put together. Casual knit top with boyfriend jeans paired with fancy strappy studded patent flats and structured handbag. On another note, I want to start writing different kinds of fashion related posts (don't worry I won't be cutting down my outfit posts). I have an interview post and other projects coming up, but what would you like to see on here? Feel free to leave me suggestions! Pointelle knit top from F21. Pink boyfriend jeans from Gap. 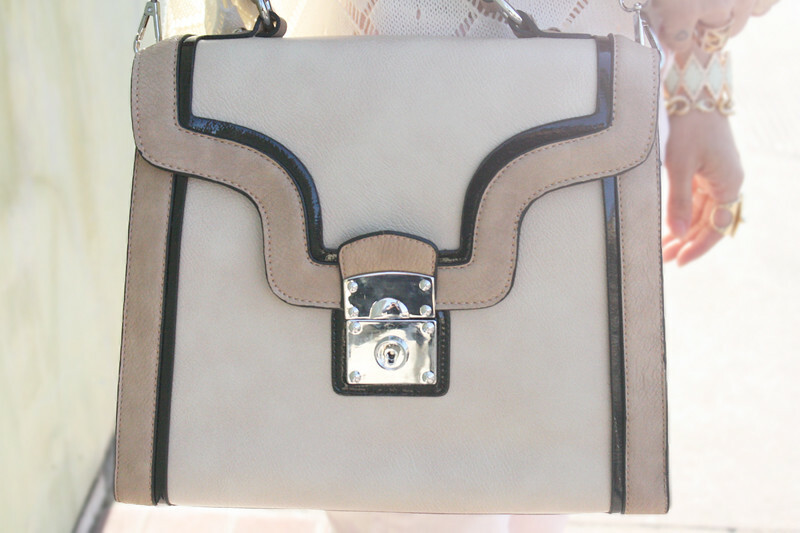 Keira bag by Melie Bianco from Piperlime. Strappy studded patent flats from Hong Kong. beautiful outfit. I love the pastell colorcombination and your accessories. Shoes and jewellery I love! Totally love your shoes! The accessories really match the whole outfit! So much lovely pink! You look sweet and delightful. I'm booking myself a flight to Hong Kong just to get these shoes - such a pretty look as ever! Oh my goodness, that shirt is just so cute! The pink pants are just the perfect touch! I love this look! Awesome shoes!